Most people don’t know that more Aboriginal children are being taken from their families today than in the ‘Stolen Generations’. We spoke with Aunt Deb Swan from Grandmothers Against Removals (GMAR). Aunt Deb started GMAR in 2014 with four other Gomeroi grandmothers, Aunt Jen, Aunt Suellyn, Aunty Hazel, and Aunty Patty, to fight the systematic removal of their grandchildren. Another woman from Gunnedah, Suellyn Tighe, applied to be the legal carer of her grandkids. “Suellyn was assessed, supposedly by ‘independent people’, but her grandchildren were placed with their white grandparents who weren’t even assessed”, Aunt Deb said. “We worked out this was happening to other grandparents and parents in Gunnedah, so we joined forces.” That was the beginning of GMAR. The “Apology” implied that the removal of Aboriginal children from their communities has stopped. Despite how strongly this idea is embedded in our national consciousness, it is false. Aboriginal children are placed in out-of-home care at a rate ten times that of non-Aboriginal children, with a placement rate of 52.5 children for every 1000 compared to 5.5 for every 1000. Tonight, there will be more than 14,000 Aboriginal children sleeping away from their families. The mechanisms of removal and relocation are coordinated by the NSW Department of Family and Community Services (FACS). Aunt Deb emphasises that FACS often removes children because of “unconscious bias”. Asked whether this bias is rooted in individuals or the organisation itself, Aunt Deb says it is both. “It’s a continuation of the APB [Aborigines Protection Board]… management wants to prove their power and control, and the caseworkers and managers prioritise [that] power and control over what’s best for the kids”. “What they should be doing”, says Aunt Deb, “is following the Bringing Them Home Report”. The Bringing Them Home Report (BTHR) was commissioned by then-Attorney-General Michael Lavarch, after years of pressure from Aboriginal organisations. It examined the trauma inflicted upon Aboriginal and Torres Strait Islander people through forced removals. The report, which was largely in response to the Stolen Generation, made recommendations to address the continued practice of removals and informed Rudd’s decision to issue an apology. Aunt Deb asserts that “when FACS are assessing Aboriginal families, they never look for strengths”. According to Aunt Deb, “FACS gives excuses” for their ineptitude such as being “overworked’”. She points out that “they would have less work if they didn’t take our kids!”. She recounts how some children have been taken away due to “reports about stupid things like playing in the front yard with no shoes on”. Innocuous things can add up to a justification for removing kids. Raymond “Bubbly” Weatherall, a Gamilaraay Maari (man) and Birriwaa (warrior) from Collarenebri, supports the work of GMAR. He and Aunt Deb acknowledge that “there are still issues” and agree that kids in immediate danger should be removed and placed with other family members, but tell us that the number and conduct of removals indicates there is a problem with the current system. One way of understanding the scale of the issue is through its financial cost. Child removals are exceptionally expensive. According to the Australian Institute of Family Studies, $3.6 billion was spent on ‘child protection and out-of-home care services’ in 2014-15. The “government should be refocusing the funds”, Aunt Deb says. She argues that the government could use its money more efficiently by offering preventative care to families. According to Deb, that would make “the family unit stronger so the kids can stay at home”. Underpinning the issue of forced removals is intergenerational trauma. As Bubbly points out, “Aboriginal families have been broken up so much.” The BTHR notes that “The laws, policies and practices which separated Indigenous children from their families have contributed directly to the alienation of Indigenous societies today.” There is a cruel irony in the fact that the circumstances from which FACS removes children were often created by the past removal of Aboriginal kids. With the continued removal of Aboriginal children, the cycle of intergenerational trauma is likely to continue. A complicating factor in child removals is that, according to Aunt Deb, FACS workers “don’t understand how Aboriginal families work”. In light of this, Aunt Deb emphasises the need for FACS to listen to Aboriginal families and communities in order to do what’s best for the kids. She points to FACS workers not “mixing with and seeing Aboriginal people in their own personal life” resulting in a bias against Aboriginal families drawn from popular media and opinion. But Aunt Deb says GMAR will not accept “reduced by 2020”, a date drawn from a Department of Social Services publication titled “National Framework for Protecting Australia’s Children 2009-2020”. “We want the kids back with their families immediately, not setting dates”. The BTHR was released twenty years ago. “I’ll probably be dead in 20 years, the kids will be over 18, if they do another research report, and you keep telling us to go through a process”. There are some indications of progress, however. Aunt Deb recounts one long term Aboriginal activist saying that GMAR was the “quickest movement to produce change” that he had seen. Some of that change is coming through work that GMAR is doing with FACS on new guiding principles on caring for Aboriginal children. “We’re working on that with them now (…) Implementing has already started. 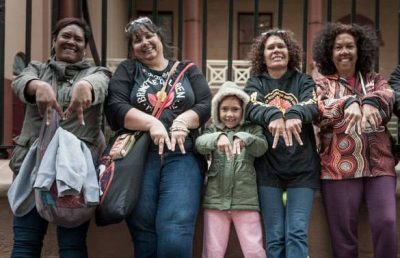 [We’re] starting local Aboriginal advisory groups – going around getting people to start their own local groups. Then going to focus on [how to] getting the kids back, so it’s a shorter and more appropriate process once they’ve found suitable relatives to get them to.” Aunt Deb and GMAR’s demands echo the BTHR’s principal finding “that self-determination for Indigenous peoples provides the key to… eliminating unjustified removals of Indigenous children”. Becoming aware, listening to Aboriginal people and believing them is the first step to addressing the issue. Otherwise, Aboriginal people will keep facing the reality that A.B. Original describe in “Jan 26”: “I turn the other cheek, I get a knife in my back / And I tell ‘em it hurts, they say I overreact”.